If I did, i assure you it was accidental. It doesn't matter what you chose the camera to follow though, as you can clearly see the planet's orbital path around the stars and it moving along that path, while the star barycenter follows no path at all. This planet has an extremely elliptical orbit and it has life. The orbit itself is an anomaly though because it's not gravitationally stable. 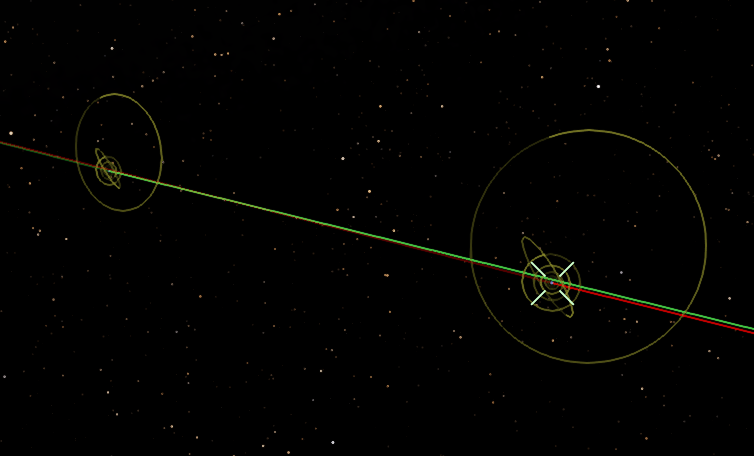 what with crossing so many orbits. The star was flickering behind and in front of the planet and moon. Did you have a location? Looks like double description of the catalog star. Looks like double description of the catalog star. As the video shows, it is a procedural system in a procedural galaxy. I see at least a couple of problems: Temperature and tidal forces. It's hard to imagine a solid surface in that position. And in this case the planet-moon system is at a height above the surface of the star that is less than 1/5 of the star's radius (that places it within the inner corona). And that also has to be inside the star's roche limit for any known planet/moon density. The systems can be found at RS 0-9-14448641-189-0-0-0-1. If it weren't for the fact that it's random, I'd have said it was a duplicated catalog object, but the galaxy itself seems fine (although it won't show the label in universe view) and it seems to have been only that specific star. I see at least a couple of problems: Temperature and tidal forces. It's hard to imagine a solid surface in that position. Space Engine computes the equilibrium surface temperature for any object based on the solar flux at its location, so you could check that. At that distance a rocky planet would indeed be molten or even have a vaporized rock atmosphere. 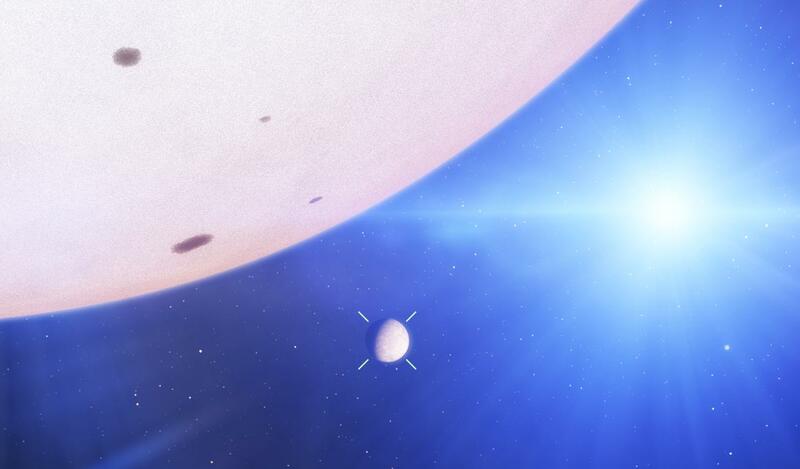 WASP-12b and KIC 12557548-b are real examples of such planets. Space Engine does not yet support molten/vaporized planets though; it just gives us a solid surface regardless of how high the surface temperature is. And that also has to be inside the star's roche limit for any known planet/moon density. Has to be? How do you know? Have you checked? I'm not a fan of assertions on how the universe operates that are unsupported by data or physics. So how about we find out for sure? 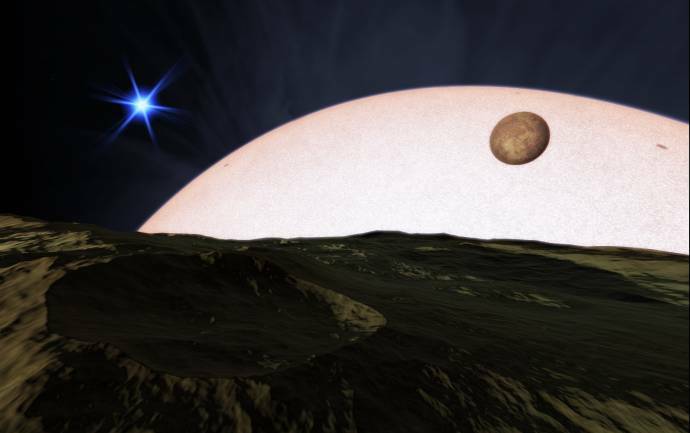 Neglecting complicating factors such as the fluid deformation of the planet, then the Roche limit is approximately 2.44 times the radius of the star times the cube root of the ratio of the star density over planet density. For a rocky planet like Earth (density ~5.5g*cm-3) orbiting a sun-like star (density ~1.4g*cm-3), the Roche limit is about a million kilometers, or ~1.4 times the sun's radius. If you consider a less dense star, like an aging giant, then the Roche limit is well within the star's radius so you could easily have terrestrial planets very close to the star without them being torn apart by tidal forces, at least for as long as the heat doesn't evaporate them completely. No, it wasn't a catalog star, it was procedural. Watsisname, Wikipedia has a pretty extensive article on the roche limit. I can't know for sure that it's accurate, but it gives some examples for the sun and different satellites. I checked the article before I posted, and since a 1/5 radius is well within the figures given in the article, I thought it safe to write "has to be". On the other hand, if the planet is solid lead and the star exceptionally fluffy, I might be wrong. Are you measuring that from the star center or the star surface? The figures you see on wikipedia are from the center, so R < 1 means it is within the primary. Indeed, wikipedia claims the rigid limit for the Earth/Sun case is 0.8, or within the Sun. (I think that's wrong though, it should be ~1.4Rsun, as shown above). I also question that article's claim that if the secondary is more than twice as dense as the primary, then the Roche limit is inside the primary for the rigid case. That does not seem correct. If you take d = RM and solve for the (inverted) density ratio, you get ~15, not 2. This is still very easy to achieve for solid planets orbiting giant stars, however. 1/5 from the star surface. A limit < 1 meaning inside the primary seems surprising considering that Saturn is less dense than ice, yet has rings extending more than 1 R from the surface. That would hardly give much support the hypothesis that the rings were the result of a moon that came within the limit. Then a moon denser than 1374 kg/m³ (most moons are) would collide with Saturn before breaking up according to the article. Anyway, something almost scratching the surface of a main sequence star would be molten, which will push the limit out of the primary even for very dense objects if the Wikipedia article is accurate. Saturn is less dense than ice? Really? What exactly is the density of ice? "Icy" bodies in our solar system can have a variety of densities depending on their precise characteristics (how much rock is in them, have they undergone differentiation, etc?). Consider that Europa is ~3g/cm^3, while Enceladus is ~1.6. 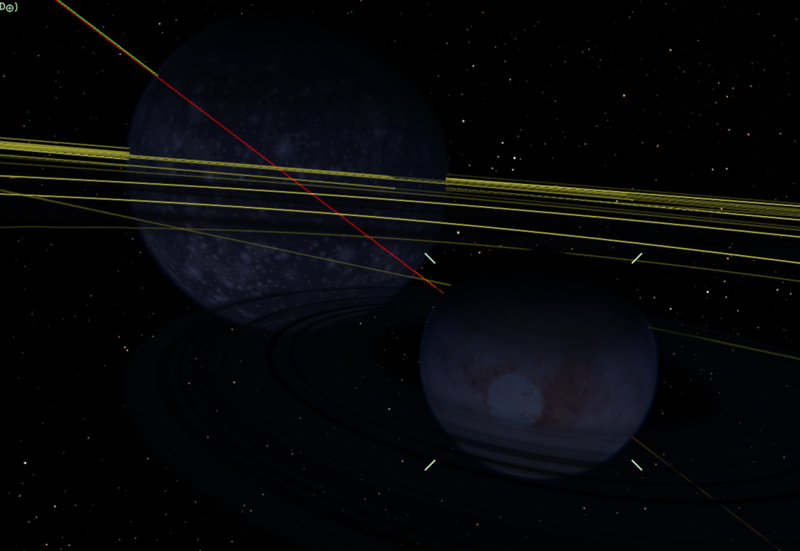 Janus is 0.63 (less than Saturn!). Comets can be around 0.5! And take a closer look at that formula again. If we assume Saturn and the ring material are of the same density, then the equation reduces to d = 2.44 RSaturn. The Roche limit does not become less than the primary radius unless the ratio of densities is greater than ~15. And yes, the origin of Saturn's rings are generally thought to be from a comet or icy moon, though there is still a fair amount of debate on this, particularly with respect to their age. This is a good article on the subject if you're interested in learning more.